The Granny Smith originated in Australia in 1868 in Mary Ann (Grannie) Smith’s backyard garden. It was there she found a seedling growing in the place where she often would discard French Crab apple cores. The seedling bore apples that Grannie Smith began using in her cooking. The apples produced such terrific and tasty dishes that Grannie Smith marketed the fruit. About a century later the apple bearing Grannie Smith’s name was introduced to America where it has grown in popularity ever since. Washington growers began planting Granny Smith in the late 1960’s. It is now the third most widely produced variety in the state. Green with an occasional pink blush, Granny Smith is a favorite of tart apple fans and is best served fresh, crisp, and cold. Even when used for cooking, the Granny Smith keeps its zesty flavor. Granny Smith apples are perfect for fruit platters and salads. This apple is now one of the most widely produced varieties in the state. 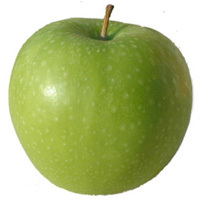 Granny Smith is much more easily preserved in storage than other apples, a factor which has greatly contributed to its success in export markets. Its long storage life has been attributed to its fairly low levels of ethylene production, and in the right conditions Granny Smith can be stored without loss of quality for as long as a year.